Did hunter-gatherers expend more energy than contemporary Westerners? This study investigated total energy expenditure (TEE) in the Hadza, "a population of hunter-gatherers living in a savannah-woodland environment in Northern Tanzania." "As expected, physical activity level, PAL, was greater among Hadza foragers than among Westerners. 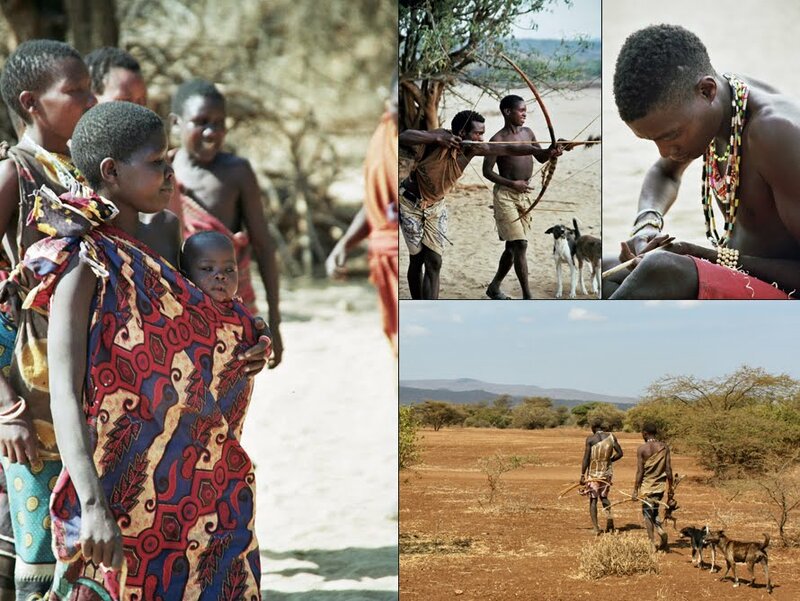 Nonetheless, average daily energy expenditure of traditional Hadza foragers was no different than that of Westerners after controlling for body size. The metabolic cost of walking (kcal kg−1 m−1) and resting (kcal kg−1 s−1) were also similar among Hadza and Western groups. The similarity in metabolic rates across a broad range of cultures challenges current models of obesity suggesting that Western lifestyles lead to decreased energy expenditure." So, relatively, we're not any less active that our forebears, yet we weigh more and have more body fat. Why? This study suggests that modern man's weight problem is more a result of overeating or poor diet than of inactivity. In fact, these authors hypothesized that energy expenditure "may be a relatively stable, constrained physiological trait for the human species, more a product of our common genetic inheritance than our diverse lifestyles." Dr. Herman Pontzer of the department of anthropology at Hunter College, New York, said everyone had assumed that hunter gatherers would burn hundreds more calories a day than adults in the US and Europe. ... The data came as a surprise, he said. "This to me says that the big reason that Westerners are getting fat is because we eat too much - it's not because we exercise too little," said Dr Pontzer. "Being active is really important to your health but it won't keep you thin - we need to eat less to do that." "Daily energy expenditure might be an evolved trait that has been shaped by evolution and is common among all people and not some simple reflection of our diverse lifestyles." What do you think? I think that diet does play a bigger role in weight than exercise. Interestingly, this study revealed a trend towards more body fat for those expending the most energy, although it did not reach a level of significance. That reminds me of a quote by Gary Taubes: "Expending more energy than we consume does not lead to long-term weight loss; it leads to hunger." "Hadza men usually forage individually, and during the course of day usually feed themselves while foraging, and also bring home some honey, fruit, or wild game when available. Women forage in larger parties, and usually bring home berries, baobab fruit, and tubers, depending on availability. Men and women also forage co-operatively for honey and fruit, and at least one adult male will usually accompany a group of foraging women. The Hadza are highly skilled, selective, and opportunistic foragers, and adjust their diet according to season and circumstance. Depending on local availability, some groups might rely more heavily on tubers, others on berries, others on meat." ________Photo of Hadza from Wikipedia. I've been reading lately on prehistoric vs neolithic food sourcing, prep, & storage, & one of the consistent themes is that paleo hunter-gatherers had considerably more leisure time than subsequent neolithic farmers. Neolithic energy expenditure per kcal of return was much higher. Both in paleo and neo times, though, when it came to small-grained grasses, the time/energy expenditure to prep them was quite high compared to the return, which is why the neos eventually abandoned SGGs for larger grained, starchier foods like emmer, einkorn, barley, etc. Btw, based on personal experience (mine & hub's), I do think energy expenditure plays a role in losing weight & maintaining weight loss,though it's obviously not the only factor. This makes sense! I know a lot of people who try to exercise their weight off and nothing works till they change there diet. It's like they think they can eat anything they want and at the gym they're on the bike "I'm working off 3 donuts!" Ain't gonna happen. "Research overwhelmingly suggests that significant weight loss cannot be achieved by exercise alone and that, in some cases, working out is the root cause of extra pounds. John Brewer, professor of sport at the University of Bedfordshire, says too many people wrongly assume weight will tumble off once they start going to the gym. You won’t shed much if your diet is poor."